New York Rangers President and General Manager Glen Sather announced today that the club has agreed to terms with defenseman Steve Eminger on a new contract. Eminger, 27, skated in 65 games with the Rangers last season, registering two goals and four assists, along with 22 penalty minutes. He made his Rangers debut in the season opener on October 9 at Buffalo, and tallied his first point as a Blueshirt with an assist in the home opener on October 15 vs. Toronto. Eminger ranked third on the team with 101 blocked shots. The Rangers posted a record of 4-1-1 when he tallied a point. The eight-year NHL veteran recorded one assist and posted a plus-three rating while skating in his 400th career NHL game on March 4 at Ottawa. Eminger notched his first goal as a Ranger on November 24 at Tampa Bay and posted a season-high, plus-four rating in an 8-2 win vs. Edmonton on November 14. 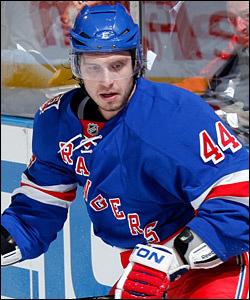 Defenseman Steve Eminger, who played in 65 of the team's 82 regular-season games in 2010-11, returns to the Blueshirts after agreeing to contract terms as an unrestricted free agent on Monday. The 6-2, 203-pounder has skated in 411 career games with the Rangers, Anaheim Ducks, Florida Panthers, Tampa Bay Lightning, Philadelphia Flyers and Washington Capitals, registering 17 goals and 74 assists for 91 points, along with 323 penalty minutes. Eminger posted a career-high, plus-five rating, tying Anaheim’s franchise record for plus/minus rating in a single game, in a 5-2 win at Colorado on March 31, 2010. In 2008-09, Eminger established career-highs in games played (71), assists (21), points (26), power play goals (two) and shots on goal (85), and tied his career-high in goals (five) while splitting the season between Philadelphia, Tampa Bay and Florida. He tallied his first career NHL playoff point with a goal in Game 4 of the Eastern Conference Quarterfinals at Philadelphia on April 17, 2008. Eminger registered his first career NHL goal on October 10, 2005 vs. the Rangers. He made his NHL debut on October 11, 2002 vs. Nashville and recorded his first career point with an assist on October 10, 2002 at Toronto. The Woodbridge, Ontario native was acquired by the Rangers from the Ducks in exchange for forwards Aaron Voros and Ryan Hillier on July 9, 2010. He was originally selected as Washington’s first round choice, 12th overall, in the 2002 NHL Entry Draft.